Hair and Beauty students showed off their ‘fantasy’ themed looks when their models took to the catwalk on 25 January. 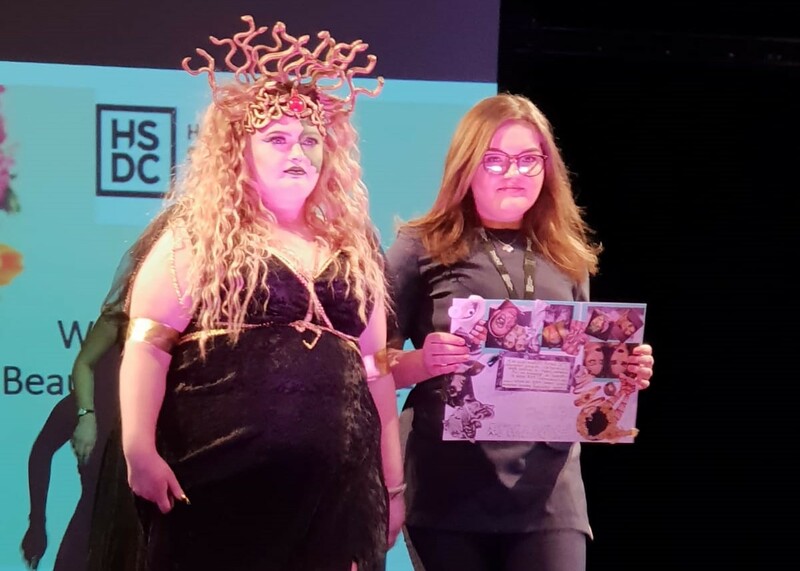 Students from across the Hair and Beauty courses were tasked with creating ‘total looks’ inspired by the fantasy theme, which were presented to members of the public in the Havant & South Downs College Theatre. Level 3 Production Arts Make Up student, Helen Beswick, said: “For my look I have chosen the idea of Mother Nature to fit in with the theme. I am using a wig made out of wool and mesh to create the look. Speaking about the process leading up to the show, Helen said: “We started preparing mid-December so we have had some time to get ready. I was looking at different nature ideas then landed on Mother Nature. Beauty Therapy student Jasmine Hind said: “As part of the fantasy theme I went with the idea of a mermaid. I have put curlers into the hair of my model to create beachy hair and then spray it blue. I have got the mermaid outfit all sorted as well. “Seeing the looks on the catwalk is going to definitely be a highlight for me, when all the stress of getting it done is over! For more information about our Hair and Beauty courses, click here.